Works great with the Porter Cable 7424XP Random Orbital Buffer, Griot's Garage Random Orbital Polisher 6" 3rd Generation, Meguiar's Dual Action Polisher G110v2, etc. Easy installation, simply screw it into place! With traditional buffers you would have to screw in each pad with a wrench or deal with bonnets. 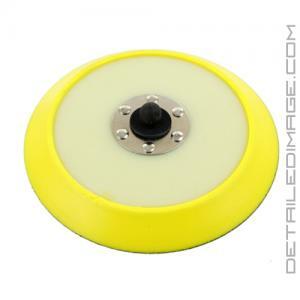 This backing plate is designed to screw right into the Porter Cable 7424XP Random Orbital Buffer, Griot's Garage Random Orbital Polisher 6" 3rd Generation, Meguiar's Dual Action Polisher G110v2, etc. so you can easily swap out your favorite pads. After the backing plate is screwed on it stays firmly attached and the hook and loop pads lock in place. The backing plate is semi-flexible which allows you to work on curves and tough to reach areas. With firm and constant pressure you can breakdown each product and work them in to the surface properly. Now your polishes will give you a deeper shine and waxes will adhere to the paint longer. Check out the various sizes of this backing plate offered and the pad recommendations for each size below! The Dual-Action (DA) Backing Plate will save you time and effort as you achieve better detailing results! Measures 148mm or 5 3/4"
Measures 125mm or 4 3/4"
Measures 85mm or 3 3/8"
Measures 73mm or 2 7/8"
Backing plate measures 48mm or 1 7/8"
With the addition of this backing plate I now have a 3", a 5", and a 6" machine hanging on the wall ready to grab at a moments notice. I believe this backing plate with 5.5 pads will enable me to better hone in on paint correction issues. Looking forward to the warmer weather so I can start using this item in the shop. Bought to use with a PC I bought on here. Works well. Pad adhesion is almost too good. Somewhat flexible, which is good, at least for a novice, when going over body lines. bought this as a replacement plate for my first DA polisher ever which was from HF. It immediately calmed the DA down so it ran much smoother as it is nicely balanced. This and the low profile pads worked great on my first project... brought my 13 year old white oxidized truck paint back to a beautiful shine for a novice I loved it and I'm pretty sure it contributed highly to my success.